Designed to safely stack your wines on their side to protect the corks from cracking and damaging your precious bottles of wine. Can be used either on your fridge, side stable ,kitchen bench to maximize your storage space. At approximately 14.5 inches wide, 7.6 inches tall and 7.6 inches deep. ✔ Metal wine rack: This metal wine rack has room for up to 7 standard bottles of your favorite wine. ✔ Free standing display: With the wine rack's free standing display, you can place it on a counter top, a table, or anywhere that best suits your home. ✔ Clean design: The simple yet elegant design of the wine bottle rack makes it a great display piece that you'll be proud to have out. ✔ Handcrafted from: wrought iron for long-lasting beauty even under rigorous use. 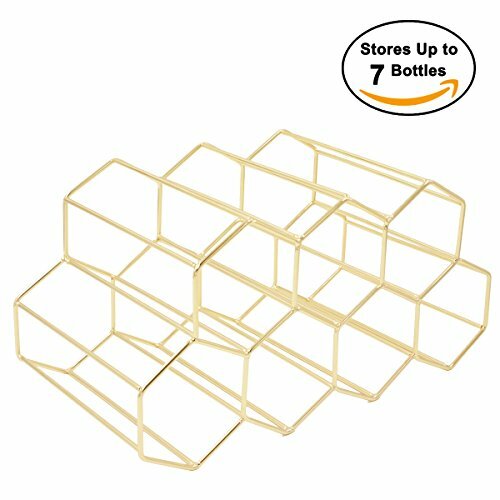 ✔ Size: wine rack is 14.5"x7.6"x7.6" and holds 7 bottles of wine.